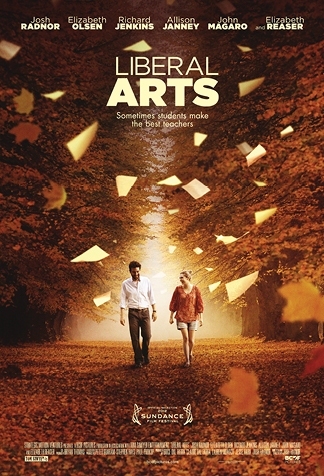 Josh Radnor’s ‘Liberal Arts’ is nothing short of amazing and was a perfect film to open up the 2012 Dallas International Film Festival. Most of you might know Radnor from the hit television series ‘How I Met Your Mother,’ where he plays the hopelessly romantic lead character. But with ‘Liberal Arts’, Radnor throws out the laugh-track-style comedy and give you one of the smartest and most genuine performances of the past few years. I have no doubt that audiences will fall in love with the incredible cast, witty dialogue, and light-hearted yet heart-felt story. ‘Liberal Arts’ follows Jesse (Radnor), a 35-year-old guy who has a problem being an adult. Although his peers have moved on with their lives, Jesse still holds onto the college years by working as a college admissions counselor at a New York City college. In the hilarious opening scene, which is strikingly reminiscent of a scene from Woody Allen’s ‘Deconstructing Harry’, the camera continuously and solely focuses on Jesse as he interviews prospective students. We immediately figure out that Jesse is bored with his life– and yet perpetually stuck. Out of the blue, one of Jesse’s old professors from his alma mater (Richard Jenkins) asks him to speak at his retirement ceremony. Jesse jumps at the opportunity to get out of the city and head back to his college town for a few days. There, he meets a free spirited 19 year old girl named Zibby, played by Elizabeth Olsen. The two quickly find out that they share a great love for the same music and literature. Although Jesse has to return to the city, the two of them write each other hand written letters for several months. Through these letters, their relationship blossoms and Jesse is able to escape from the realities of his adult life. But when Zibby asks Jesse to come down and visit her, Jesse has to examine his intentions and the implications of their age difference. In an incredibly funny scene, Jesse puts pen to paper to calculate his and Zibby’s age difference at different times in their lives (i.e. when he was 19 years old, she was only 3). Although Jesee decides to visit her, when he gets there, he realizes it’s not going to work. By seeing that Zibby was too young to understand the complications involved in adult relationships, Jesse realizes he has to move on with his life and accept that he is an adult. Jesse’s character is one of the most genuine characters to grace the big screen. You will continuously root for him and hope he makes the right decision. Actually, you root for all of the characters. They are all so likable and real. Radnor did an amazing job writing each of these characters and giving them unique voices. I especially loved the character of Nat ( Zac Efron), an energetic college-aged hippie, who kept popping up in the most random moments of the film to advise Jesse on how to grow up and get the girl. Also, the music in the film was great. As soon as I got home, I bought the entire soundtrack. My only gripe about the film is that it lacks artistic style and is visually unsatisfying with the exception of a few shots. The visual style of the film came across vague and it shouldn’t have, since it takes place partly in New York and in a gorgeous small college town. 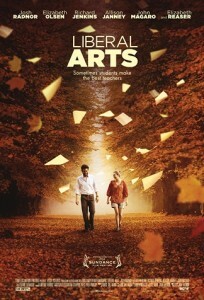 However, ‘Liberal Arts’ outshines many other films with its brilliant writing and acting. The story and characters have as much heart and authenticity as those in ‘Little Miss Sunshine’. I would love to see more comedies like this in the future. This entry was posted on Saturday, April 14th, 2012 at 12:06 pm	and is filed under Film, News. You can follow any responses to this entry through the RSS 2.0 feed. You can skip to the end and leave a response. Pinging is currently not allowed. « Dallas International Film Festival Opening Night!! !